Life was different in the 1990s. Back in ‘93, a lucky few used dial-up Internet to access one of 800 websites available worldwide. Smart phones were a distant dream. The TV dinosaur Barney had just started “edutaining” America’s children. And gas cost about $1.30 a gallon — including 18.4 cents in federal taxes to build and maintain our roads, bridges, and transit systems. Now, 22 years later, the Internet is all-encompassing, smartphones are ubiquitous, and Barney’s been dormant for years. Gas for $1.30 is a distant dream, even in these oil boom days. Yet for some reason majorities in both houses of Congress expect good roads for the same 18 pennies per gallon we paid in 1993. Rather than agreeing on a long-term fix for the gas tax, Congress has kicked the can down the road. It’s passed 33 short-term fixes in the last six years. Each time, the Highway Trust Fund’s solvency becomes even more perilous. Image via Doug @ Flickr. Decades of deferred maintenance on our nation’s infrastructure have resulted in needless congestion, dangerous bridges, and less reliable public transit. We’re nearly $1 trillion behind on transportation investments, according to the American Society of Civil Engineers. The Highway Trust Fund was established in 1956, funded by a 3 cent-per-gallon tax on gasoline, to build our Interstate Highway System. The tax was increased a little each year to keep up with inflation and ensure our roads were well tended. But since it got stuck at 18.4 cents in 1993 — about 30 cents in today’s dollars — this revenue no longer covers the tab for even the most critical repairs and investments. A sustainable solution would permanently align expenditures with revenue. Instead, some members of Congress and the Obama administration are pursuing more temporary fixes. One of the leading proposals would ask a small number of very large corporations — including Microsoft, Google, and Citigroup — to pay a small portion of the taxes they owe on $2 trillion of untaxed profits they’ve stashed offshore. A lot of that money was earned doing business in the United States, but the companies shifted their profits offshore using legal accounting tricks for the express purpose of avoiding taxes. Under plans proposed by President Barack Obama and two senators — New York Democrat Chuck Schumer and Ohio Republican Rob Portman — corporations would pay about $150 billion of the more than $500 billion in taxes they owe. The remaining $350 billion would simply be forgiven. 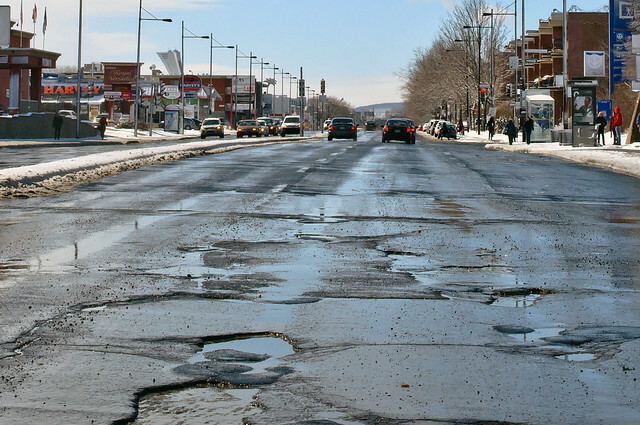 That $150 billion could fund six years of highway repairs. But this money — just a fraction of what those companies actually owe — would be a one-time windfall. By 2021, we’d be back in the same fix, having squandered a big pot of funds we could have otherwise used for investments in worn-out schools, dams, and levees — while rewarding corporate tax dodging, too. And by then we could still be stuck with a gas tax set nearly three decades before. There are much simpler solutions. Closing the funding gap would only require drivers to pay a dime more per gallon in gas taxes today. Other options include stopping companies from shifting U.S. profits to offshore tax havens in the first place, and using the $90 billion a year in revenue that would result to make a down payment on roads and other infrastructure needs. If Congress refuses to ask drivers to pay 21st century prices for 21st century roads, our once world-class infrastructure will go the way of dial-up Internet. We’re nearly $1 trillion behind on transportation investments. If Congress refuses to ask drivers to pay 21st century prices for 21st century roads, our once world-class infrastructure will go the way of dial-up Internet. Over a seven-month period in 1965, Congress passed five significant laws that forever changed life in America. What Congress accomplished then puts today’s lawmakers to shame.